The release of The Silver Globe in 2014 was a watershed moment for Jane Weaver. As it was described on this site, she had taken "a full-scale leap into the cosmic void of contemporary space rock"; it opened new doors for the long-established singer and composer. She and her live band seized every opportunity its success afforded them, scaling festival bills and embarking on a far-reaching UK tour during the twelve months that followed its release. But four years on, with a second successful album released last year in the form of Modern Kosmology, she plans to shake up how she presents her music live with her first solo tour in over five years. What Weaver has in store sounds suitably cosmic. Audio/visual concerts built around cyclic variations of The Silver Globe and Modern Kosmology material, incorporating "custom-built vinyl discs... tape loops and zoetropic imagery." Eager to hear more about the ambitious production, we spoke to Jane about her touring plans, her relationship with her latest records and thoughts on the ideal live music venue. What was the spark that led to this solo touring concept? Does it pose any artistic challenges? 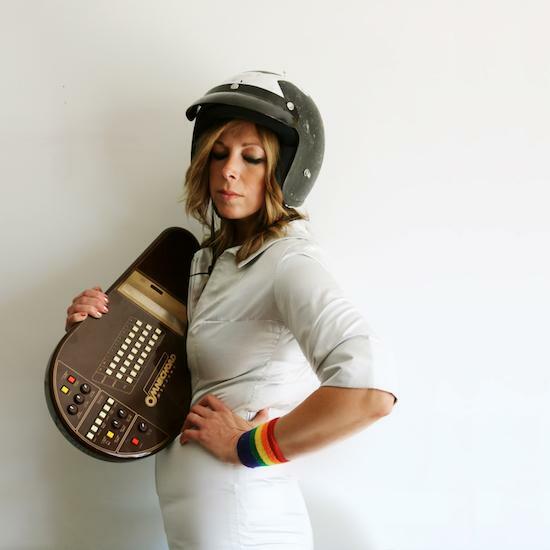 Jane Weaver: I love performing with a band, but I want to do some special, one off shows... ones that aren’t just me with a guitar. I don’t get much chance to actually play many instruments live, as I’m usually singing and moving around – I play all the synths in the studio etc. – so it will be nice to actually do more on stage. I also love film soundtracks so its fulfilling the need to do something more cinematic too. You’ll be appearing on stage with an "assemblage of custom-built vinyl discs, unlikely instrumentation, tape loops and zoetropic imagery". Can you explain a little more about those bespoke items and how they’re harnessed? JW: I don’t want to go into too much detail, I want it to be special for those people coming to the gigs, but it’s based on something I’ve done before, combining DJing and performing, using electronic instrumentation and imagery. I spend a lot of time in the studio creating arrangements of music for live, with a band. Solo arrangements of these present different challenges, there’s lots to be mapped out! You had access to some remarkable and rare analogue equipment when creating The Silver Globe and Modern Kosmology. Will you be able to transport the sound of those instruments into the live environment, even if the equipment itself can’t be toured? JW: I’ll be using as much of it as I can for this tour. The main problem with my vintage gear is that I worry bits of it won’t survive! they all have quirks and personalities, when I travel with the band and abroad I mainly use new stuff for this very reason. I think some people are surprised to see me using modern and cheaper stuff sometimes, but I’m not a snob about equipment, my preference is for boutique and rare because those sounds are so distinctive, they have history and stories to tell…but you also have to be practical. Some artists find it difficult revisiting their recorded material. Is this the case for you or has the critical acclaim that those record met with, informed a positive relationship with them? JW: I’m still very positive about the records – it’s nice when people like what you’ve been working on. Nothing is ever written or recorded under perfect conditions or circumstances, so who knows what the response to these versions could be. At the end of the day I love writing songs and exploring new sounds. I think we are all getting conditioned to be in a hurry, to move onto the next thing because of the nature of the industry. It’s very fast and furious because of digital releases, we probably all need to calm down and live with stuff for longer, let stuff breathe a little more. The mass over exposure and pressure in order to keep up is across the board. What was it about Loops In The Secret Society and its title, that leapt out at you when deciding on a name for the tour? JW: The inspiration behind it is drawn from my muse for Modern Kosmology: Hilma Af Klint. She was a Swedish abstract artist in the late 1800s onwards, who used spiritualism and automatic painting in her work. She also formed a secret society of other female artists who would partake in seances to channel energy for creativity etc. I won’t be performing seances at every gig, but want the shows to be more electronic than usual, so who knows! We live in an age where artists are asked to reveal a lot about themselves and their working process, but conversely, we seem to revere those artists whose lives and creations were, or still are, shrouded in mystery. Do you give much consideration to how much you reveal and how much you retain? JW: Modern Kosmology is about creative energy, so it felt right to reveal and to do that for this record. I’m always interested in how ideas come to us, I’m interested in the process, I actually don’t like to talk about it. You shouldn’t really need to, but I felt for this record it was necessary to explore and open the dialogue. I love looking at studios and what gear everyone uses. Exposing your vocals and by extension, your lyrics, was one development you made on Modern Kosmology. Has that given you the confidence to do the same in the live setting, with material from both records? JW: It seems silly saying, "I turned up the vocal level" or that it has any bearing on anything, but to me it was a big deal to expose my voice more on record. I think at these solo shows I’ll probably be embracing more drone and experimental stuff, so it will be different to both the record and the band shows. I want to use my voice as part of the picture so it’s with everything and not sitting on top. In relation to this live production and your experiences as a performer and a music fan, what do you feel makes a great live music venue? JW: We’ve played some beautiful places recently in Europe with Belle and Sebastian and Public Service Broadcasting. Some were beautiful old theatres. Sound wise, I don’t really like our music to be polite out front, I like heavy music and as a music fan, I like to feel it in my bones! As a performer, as long as I can hear myself on stage and I’ve got a dressing room with a mirror and a pre-show drink, I’m pretty happy. How important has Andy Votel’s support and guidance been in recent years and do the two of you share musical common ground when it comes to soundtracks, psychedelic and outre music? JW: Andy is really important, his love of rare music/films and books has genuinely served me well over the years, I would have never heard some of the best music of my life if it wasn’t for him. He introduced me to Broadcast, David Axelrod and heavy Chilean Psych when we first got together. I don’t like some of the more concrete avant-garde stuff he's into, but mostly it’s cool. We don’t work together in the studio musically much at all, he doesn’t come to the studio with me, when we have worked together we kind of stay out of each other's space. When Andy and Badly Drawn Boy were recording the guitar solo for 'Don’t Take My Soul', I stayed at home!